I have been doing regular posts on the allotment but I thought it might be interesting to join in with the Garden Bloggers Harvest Day meme hosted by Barbie and Christine. However, despite it being June the cold weather we had recently has slowed everything down and delayed young plants being planted out so in fact there is little to harvest at the moment. There is a real sense of anticipation that the strawberry harvest will be fantastic this year. 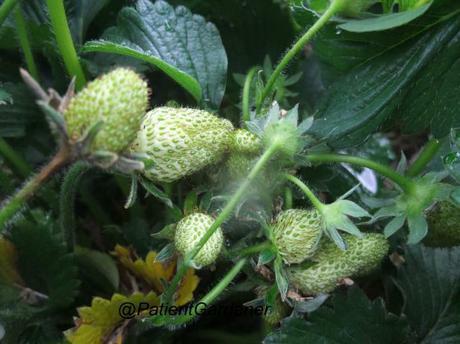 The fruits seem to have been sitting there for weeks and I am beginning to wonder whether I should remove some of the leaves to try to get the sun to the fruits. 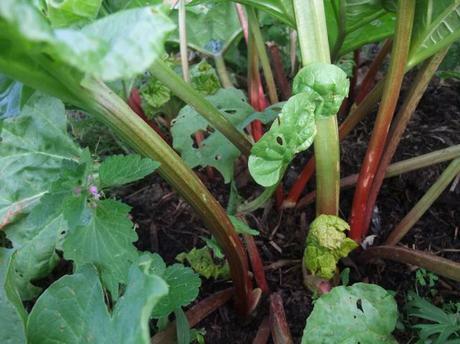 We have been harvesting rhubarb although it hasn’t been as prolific as I had hoped. I have two plants planted last year. One of them sent up flowers and has only just started to crop properly after I removed the flowering stems right to the ground. The other seems to be producing quite thin stems which could be the variety; it was in my garden and I have no idea of the variety so who knows. Anyway we have had numerous rhubarb crumbles and I have made some rhubarb and ginger jam which I have to say is quite divine. I am hoping to get enough in the next couple of weeks to make some sorbet before we have to stop harvesting. 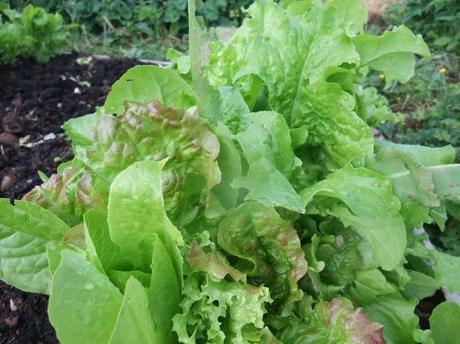 The cut and come again lettuce in the new raised bed is cropping well. I think I might sow some more as we get through a lot of it in the summer. The pak choi has been less successful; two batches have bolted before they were big enough for me to harvest. I suspect it is the wet one minute, hot one minute weather we have had. I will try another row but then will leave it to late summer/early autumn. This week I harvested the first onions. 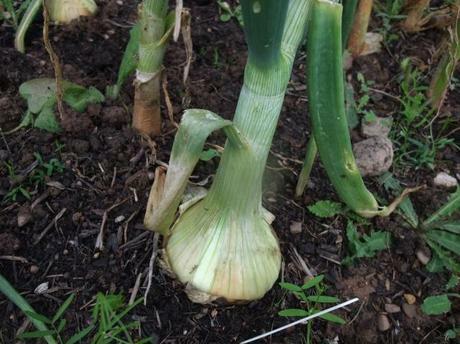 I planted these as sets back in the Autumn, they are Japanese Overwintering Onions and I am really pleased with the result. I will definitely be planting more of these sets this Autumn. As I am still on a steep learning curve I wasn’t sure when I should harvest them. However one of my fellow allotment holders advised that this variety doesn’t store very well so I should harvest as I needed. Result delicious succulent onion for the stir fry. The gooseberries are imminent. 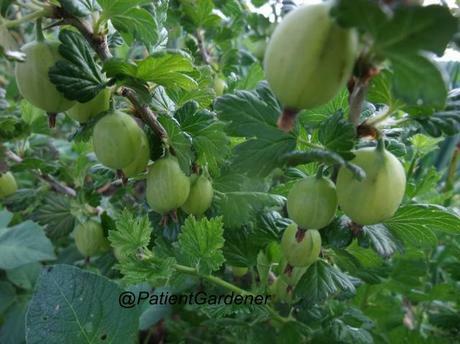 This will be the first gooseberry crop and I am quite excited at the prospect. Last year the plants were new and then it was very hot, dry and windy and the few fruits fell off the plants so fingers crossed for a glorious bountiful crop. 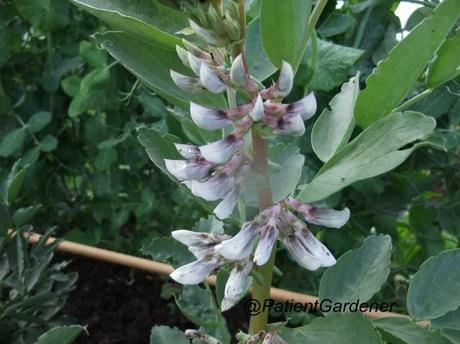 The broad beans and mangetout are now flowering so it can’t be long now before we start to harvest them though I am sure we were harvesting broad beans by this time last year. 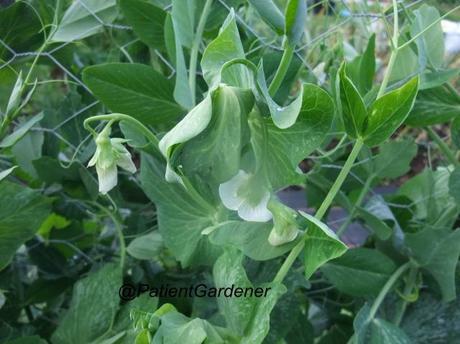 I don’t know why I am being impatient as I will probably be moaning in no time about how many broad beans we have.